After completing her early vocal and stage training in Göteborg, Helena Döse was put under contract with the Göteborg Opera House. She was scheduled to make her debut in the autumn of 1971 as Mimi in Puccini’s Bohème, but before that event something else happened that was to have a decisive effect on her career. 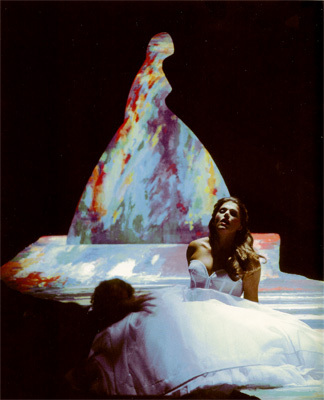 In September of the same year Verdi’s Aida was staged as part of the 350th anniversary celebrations of the city of Göteborg, and Helena Döse who had been rehearsing the title role as an understudy for Birgit Nilsson had made such a favourable impression on the opera management that it was decided to put on an unscheduled performance, featuring the young débutante in the leading role. On that memorable night nearly 8 000 people were able to watch a new star being born. Since then Helena Döse has been engaged by numerous opera houses like Gothenburg, the Royal Opera House, Stockholm, Copenhagen, Oslo, Berne, Zurich, Covent Garden, Sydney, Melbourne, Paris, Marseilles, Amsterdam, Hamburg, Frankfurt, Berlin, Vienna, San Francisco, Houston, Toronto, Buenos Aires and Sao Paolo. This page's aim is to provide a glance at the artistic life of Helena Döse who has commited herself to teach the art of singing. The very sucessfull series of Master Classes that Helena Döse has held since 2006 will continue 2012. For further information click here.